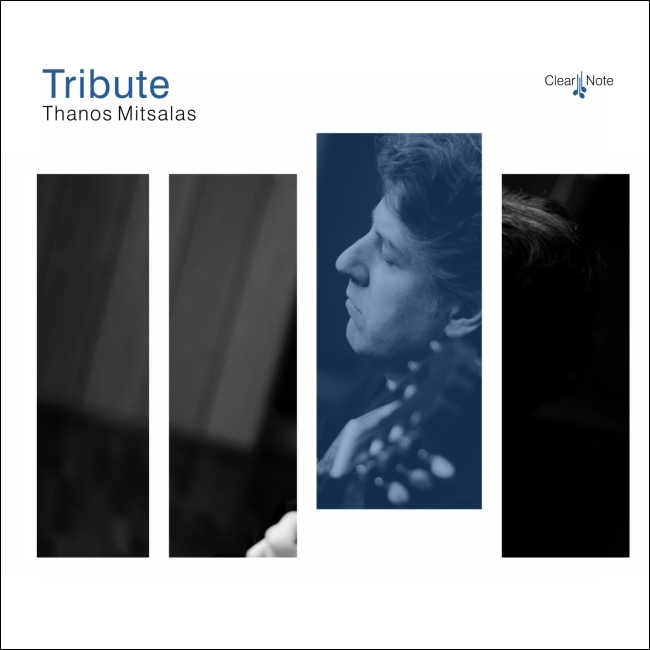 TRIBUTE invites you to leave the daily stressful rhythms and concerns of life behind. The listener should open his mind and soul so as to experience healing and spiritual regeneration through music. The program mostly follows the structure of a live recital presentation and is dedicated to this great inspiring music created by distinguished composers over the last hundred years. The musical canvas includes many and diverse compositional styles like impressionism, flamenco, jazz, latin, neo-classicism, etc. All these musical gems blend so easily together to lead to an unpretentious familiar journey surfacing treasurable musical memories. So, let the music begin! 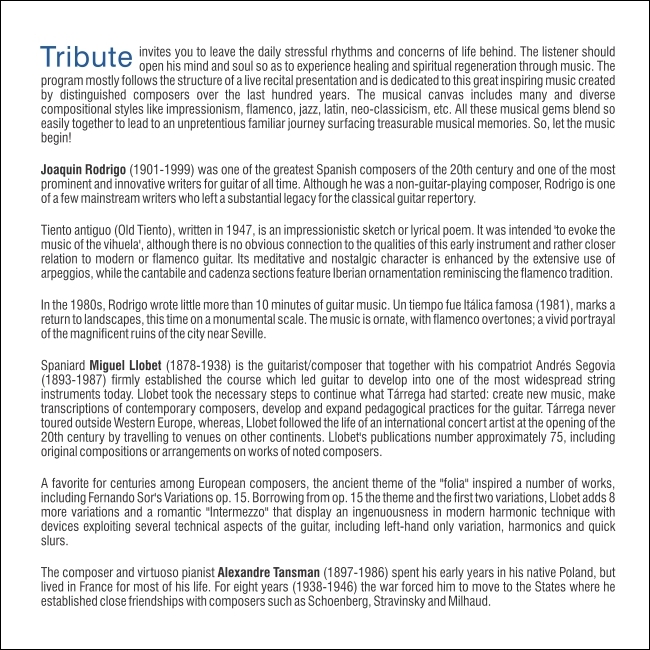 Joaquin Rodrigo (1901-1999) was one of the greatest Spanish composers of the 20th century and one of the most prominent and innovative writers for guitar of all time. Although he was a non-guitar-playing composer, Rodrigo is one of a few mainstream writers who left a substantial legacy for the classical guitar repertory. 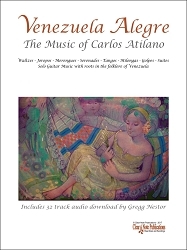 Tiento antiguo (Old Tiento), written in 1947, is an impressionistic sketch or lyrical poem. It was intended 'to evoke the music of the vihuela', although there is no obvious connection to the qualities of this early instrument and rather closer relation to modern or flamenco guitar. Its meditative and nostalgic character is enhanced by the extensive use of arpeggios, while the cantabile and cadenza sections feature Iberian ornamentation reminiscing the flamenco tradition. 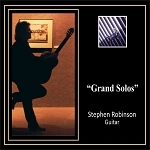 In the 1980s, Rodrigo wrote little more than 10 minutes of guitar music. Un tiempo fue Itálica famosa (1981), marks a return to landscapes, this time on a monumental scale. The music is ornate, with flamenco overtones; a vivid portrayal of the magnificent ruins of the city near Seville. Spaniard Miguel Llobet (1878-1938) is the guitarist/composer that together with his compatriot Andrés Segovia (1893-1987) firmly established the course which led guitar to develop into one of the most widespread string instruments today. 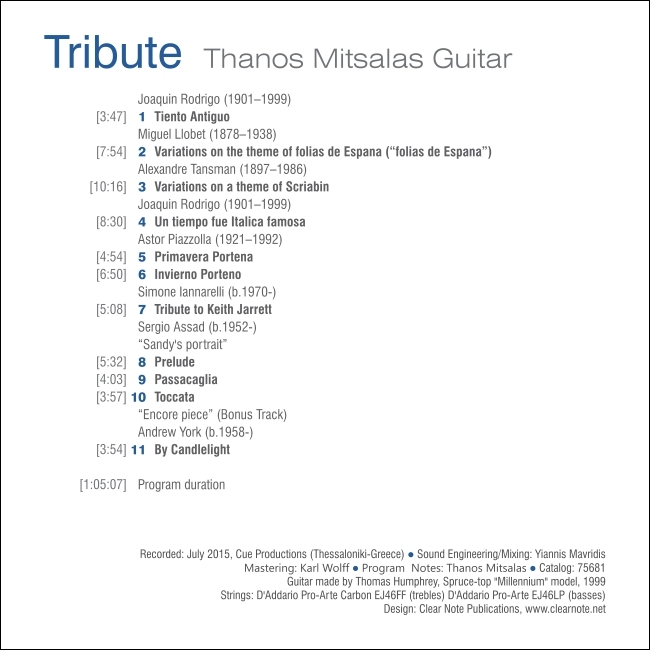 Llobet took the necessary steps to continue what Tárrega had started: create new music, make transcriptions of contemporary composers, develop and expand pedagogical practices for the guitar. 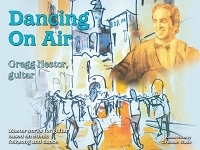 Tárrega never toured outside Western Europe, whereas, Llobet followed the life of an international concert artist at the opening of the 20th century by travelling to venues on other continents. Llobet's publications number approximately 75, including original compositions or arrangements on works of noted composers. A favorite for centuries among European composers, the ancient theme of the "folia" inspired a number of works, including Fernando Sor's Variations op. 15. Borrowing from op. 15 the theme and the first two variations, Llobet adds 8 more variations and a romantic "Intermezzo" that display an ingenuousness in modern harmonic technique with devices exploiting several technical aspects of the guitar, including left-hand only variation, harmonics and quick slurs. The composer and virtuoso pianist Alexandre Tansman (1897-1986) spent his early years in his native Poland, but lived in France for most of his life. For eight years (1938-1946) the war forced him to move to the States where he established close friendships with composers such as Schoenberg, Stravinsky and Milhaud. 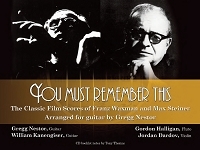 Tansman was persuaded to write for the guitar after having been introduced to Andrés Segovia during his stay in Paris in 1921. His Variations on a theme of Scriabin, dedicated to Segovia, was written in 1972, although Tansman later reworked some parts of the harmonization of the original work. The theme, Scriabin's Prelude, Op. 16, No. 4 in E flat minor (for piano), was also arranged and published for solo guitar (in B minor) by Segovia earlier in 1945 (publ. Celesta Publishing Co., New York). The composition has six variations, each one focused on different musical and technical aspects. Variation I conveys the theme to the bass line, with an accompaniment in the treble. Variation II (slightly faster), explores the harmonic potential of Scriabin's melody, while Variation III is a contrasting lively (Vivo) episode in semiquavers. Variation IV explores the changes of tonality through ingenious modulations. The fifth variation, Allegretto grazioso (quasi Mazurka), is the composer's homage to Poland and reference to the great Frederic Chopin. The final variation is a tight contrapuntal fugato movement, which ends with a quieter slightly altered statement of the theme. The Argentinian Astor Piazzolla (1921-1972) is known as the world's foremost composer of nuevo tango, a new style of tango which incorporates elements from jazz and classical music. His compositions Estaciones Porteñas or The Four Seasons of Buenos Aires were originally treated as different compositions rather than one suite, Piazzolla performed them together from time to time. 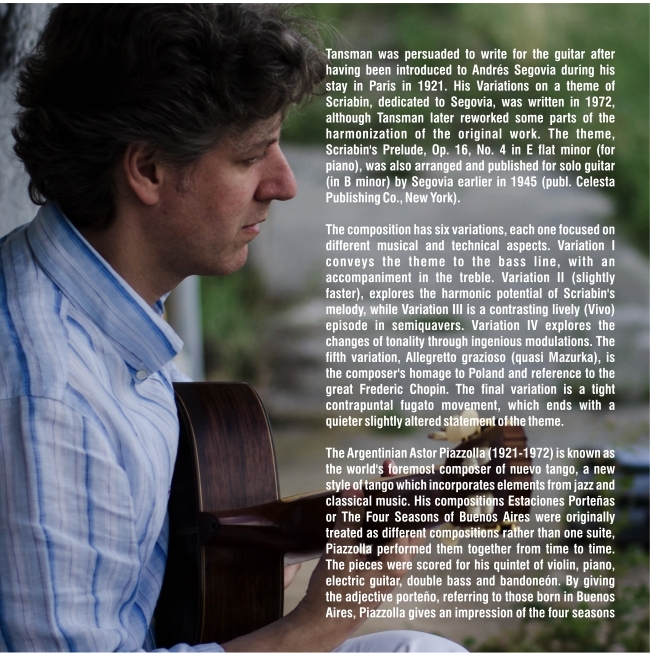 The pieces were scored for his quintet of violin, piano, electric guitar, double bass and bandoneón. By giving the adjective porteño, referring to those born in Buenos Aires, Piazzolla gives an impression of the four seasons in Buenos Aires. Brazilian composer Sergio Assad arranged this set of pieces for solo guitar in 1994 as a commission by Gendai Guitar Magazine (Japan). Two pieces of this four movement set of arrangements are presented here in this CD; Primavera Portena and Invierno Porteno. These tracks demonstrate Assad's ingenuity in creating polyphonic textures that circumvent the limitations of the guitar. The form remains very clear, with great variety of texture, tempi, keys and mood between sections, reproducing the form of Piazzolla's original quintet version almost identically. 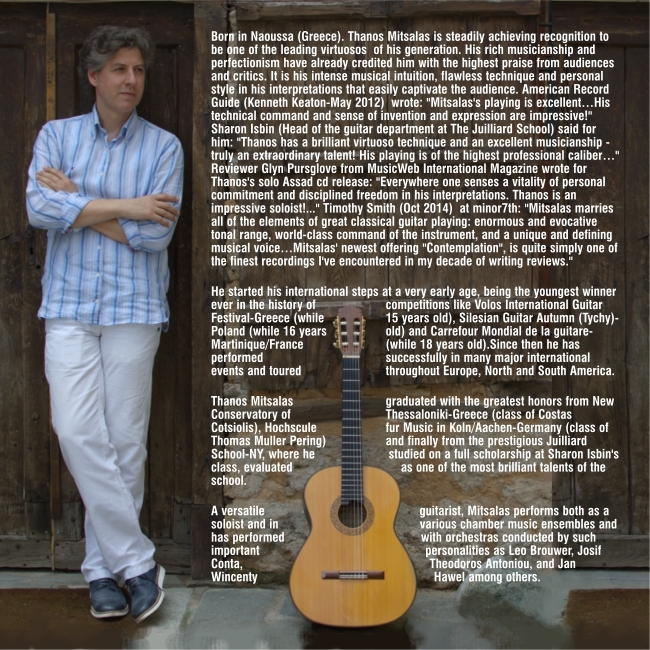 Simone Iannarelli (b.1970) is an Italian composer/guitarist. During the last decade he has been living in Mexico where he teaches guitar at the University of Colima. In his compositions Iannarelli almost instinctively follows an idiomatic romantic sound palet, but not only. 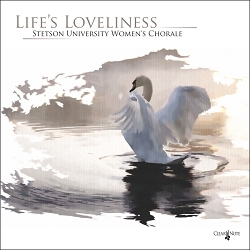 Different tunings, diverse sonorities and exotic harmonies create moods from heavenly peaceful to lively and vibrant. In this Tribute to Keith Jarrett, one can easily feel the Jazzy mood just from the first notes. Polymetric writing and vital melodic motives, follow a fluid rhythmical pace leading to climax points always at the right time. Simone points out on his Tribute: "It was not necessary to use a theme of Keith Jarrett, after so many hours listening to his genial improvisations on the piano. The Tribute came out quite effortlessly and this demonstrates how his unique style influenced my music. Some years ago, after a KJ Trio concert in Rome, I gave to his staff the score. I hope he could read through and have a little smile. Forever Grateful". The program concludes with Sandy's Portrait (2013) by the Brazilian composer Sergio Assad (b.1952). This is the premiere recording of Assad's Sandy's Portrait. Assad says of this piece: "Sandy's Portrait (2013) is part of my ongoing collection of 'Portraits', which started with Eli's Portrait in 2004. 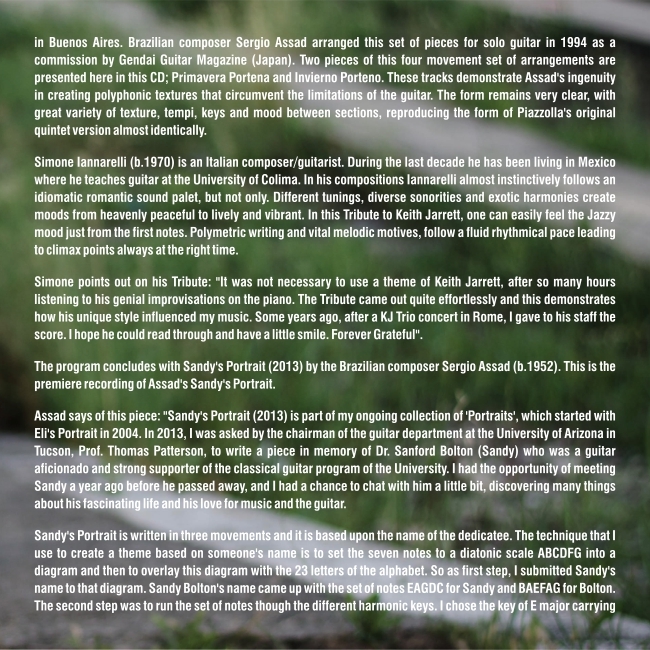 In 2013, I was asked by the chairman of the guitar department at the University of Arizona in Tucson, Prof. Thomas Patterson, to write a piece in memory of Dr. Sanford Bolton (Sandy) who was a guitar aficionado and strong supporter of the classical guitar program of the University. I had the opportunity of meeting Sandy a year ago before he passed away, and I had a chance to chat with him a little bit, discovering many things about his fascinating life and his love for music and the guitar. Sandy's Portrait is written in three movements and it is based upon the name of the dedicatee. The technique that I use to create a theme based on someone's name is to set the seven notes to a diatonic scale ABCDFG into a diagram and then to overlay this diagram with the 23 letters of the alphabet. So as first step, I submitted Sandy's name to that diagram. Sandy Bolton's name came up with the set of notes EAGDC for Sandy and BAEFAG for Bolton. The second step was to run the set of notes though the different harmonic keys. I chose the key of E major carrying 4 sharps and got a better melodic shape with the altered notes EAG#D#C# for Sandy and BAEF#AG# for Bolton. After the theme was created, I just had to think of a form in which to write the piece. 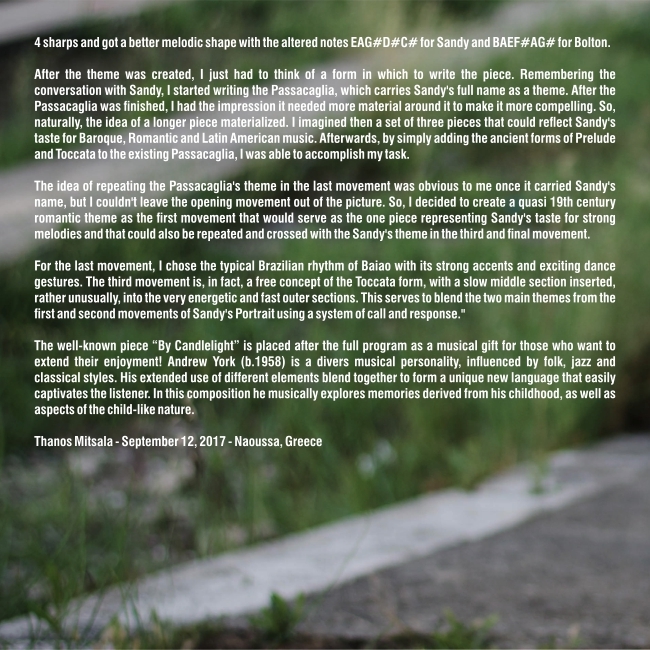 Remembering the conversation with Sandy, I started writing the Passacaglia, which carries Sandy's full name as a theme. After the Passacaglia was finished, I had the impression it needed more material around it to make it more compelling. So, naturally, the idea of a longer piece materialized. I imagined then a set of three pieces that could reflect Sandy's taste for Baroque, Romantic and Latin American music. Afterwards, by simply adding the ancient forms of Prelude and Toccata to the existing Passacaglia, I was able to accomplish my task. The idea of repeating the Passacaglia's theme in the last movement was obvious to me once it carried Sandy's name, but I couldn't leave the opening movement out of the picture. So, I decided to create a quasi 19th century romantic theme as the first movement that would serve as the one piece representing Sandy's taste for strong melodies and that could also be repeated and crossed with the Sandy's theme in the third and final movement. For the last movement, I chose the typical Brazilian rhythm of Baiao with its strong accents and exciting dance gestures. The third movement is, in fact, a free concept of the Toccata form, with a slow middle section inserted, rather unusually, into the very energetic and fast outer sections. This serves to blend the two main themes from the first and second movements of Sandy's Portrait using a system of call and response." 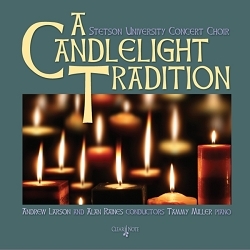 The well-known piece “By Candlelight” is placed after the full program as a musical gift for those who want to extend their enjoyment! Andrew York (b.1958) is a divers musical personality, influenced by folk, jazz and classical styles. His extended use of different elements blend together to form a unique new language that easily captivates the listener. In this composition he musically explores memories derived from his childhood, as well as aspects of the child-like nature.